Very interesting post! 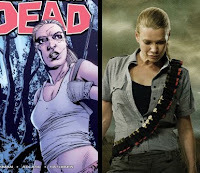 I am actually planning on examining some of the gender issues in The Walking Dead myself but I thought I'd wait until the first season has completely aired and one can have a look at the bigger picture. I have also not read the comic book, so I didn't quite know where they are going to go with this. I still remain unspoiled about most events in the comic book, so I'll try to keep it at that for the time being so that I have a sort of "immediate" and "unfiltered" input from the series. My initial reaction to the conversation of the two cops in the car in the beginning of the series was "Okay, maybe you'll get what is coming to you, huh?" That conversation really bothered me, especially because it is practically the first thing you see. And it's not just some girl-bashing talk where the viewer is supposed to roll their eyes and say: Oh, what a sad guy. The main protagonist of the series actually reinforces that viewpoint. Not only that he doesn't just not challenge his colleague's viewpoint that women are stupid, he furthers it by saying women are cruel and "men would never do this". What starts out as a "kind of funny" anecdote turns into a dead serious conversation about women being more cruel than men could ever be. Okay. Not a good beginning to a series. Anyway, I'm going to follow this series and I do enjoy it and am always looking forward to seeing new episodes! People always think that just because you are criticising some aspects about a product of popular culture you can't be a fan or something. 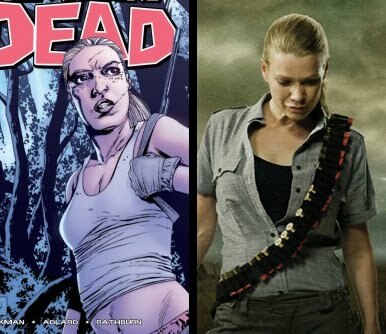 I'm really looking forward to how The Walking Dead will develope. Only 2 episodes to go!